Use Me Wherever, I Don't Scratch! Guess What? I Don't Smell! Check out the rest of the Scrub Daddy family! Multiple colours allow you to colour code your cleaning jobs. Why not use a green Scrub Daddy for outdoor cleaning, a blue for the bathroom and a red one elsewhere around the home? 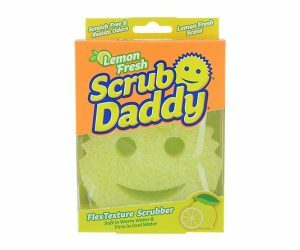 All the great scrubbing power of the Original Scrub Daddy, now with the refreshing citrus scent of lemon! Leave your dishes sparkling clean and your kitchen smelling fresh without the need for any harsh chemicals. I love our Scrub Daddy! We just bought a new house and he has been so essential in every day tasks! From kitchen, to bathroom to anything else I can imagine he scrubs and rubs our problems away with ease! I’ve bought so many that I feel like he’s part of the family! This product is revolutionary, simple and works exactly like it says it will. Consumers these days are caught up in gimmicky items that promise to work and function as they should while they inevitably fail quickly or under promise and under deliver completely. 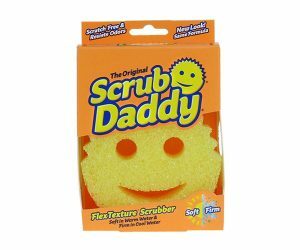 The Scrub Daddy is not this product. It makes cleaning enjoyable and effortless. Thank you for making dull parts of every day living better, cleaner and a little happier with that scrubby-soft smile! GO, SCRUB DADDY! I have tried every sponge on this planet that claims to be “odor free”. Scrub Daddy is the only one that has kept up to this claim. I have thrown out all other sponges and will never have anything but Scrub Daddy sponges in my household. I am so glad you came out with the square 4 pack. 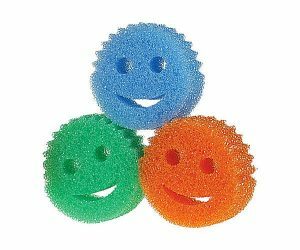 Love the little smiley guy too but the square ones with the sponge side and scrubby side are what I really needed. Love this sponge and will recommend it to everyone! My wife and I could never agree on what to wash dishes with, her sponges always had a smell to them and keeping up on the maintenance of wash clothes was a headache. We 1st saw you guys on Shark Tank and thought it was the best idea. One day while shopping at Meijer store in Michigan I saw Scrub Daddy on an end cap and purchased one. This product by far is the greatest thing for washing dishes. It never smells, it’s always clean and ready to go. I just wish I could buy them by the case! Scrub Daddy is such a small thing we changed but we feel it has made a big deference in our home. Thank you for Scrub Daddy. I just want you to know what a FANTASTIC product I think Scrub Daddy is. I watch Shark Tank faithfully and saw the “pitch” for this product and said at the time that I wanted it as soon as it hit the market. I did just that, and I LOVE it. I have purchased somewhere in the neighborhood of 50 – some for personal use but many as gifts to tout what a phenomenal product this is and get that many more people to use and buy it in the future. I have even gotten the salespeople at Bed, Bath & Beyond to buy it (and you think they surely would have with all they see coming through the lines). I have also given them to all the staff at my doctor’s office and they loved it. I always have at least one in my car so if I come upon someone I know and they have never tried it, I give it to them. And now I have recently bought the scrub sponges and love them also. I saw the Beyond the Tank episode where the discussion of many other new products are in the works and I look forward to purchasing them as well. Thank you for such an amazing product and I will continue to be a loyal consumer and product advocate. I was lucky enough to watch the shark tank episode where scrub daddy got its start. I was hooked right away. I found the sponges at my Walmart and purchased one. And I am here to tell you that this product is GREAT. It is everything you advertised it to be and I want to say Thank You. I will always be a fan of the scrub daddy family. This product is tops!!!!!!!! !